CodeClan graduate Claire, Instructor Pawel and Beyond Green’s Managing Director Paul Adderly discuss the process of prototyping an online dashboard. Pawel Orzechowski, Lead Instructor at CodeClan: “During their 16 weeks at CodeClan our students work on three projects. We constantly update project briefs to keep them realistic and exciting, but recently we tried a new approach. We thought: what if, for one week, students worked not only on a real project, but also with real client and on that client’s premises? From this question, our scheme of industry cooperation was born. “Meanwhile, our industry partners kept suggesting short one-off projects that could be undertaken by students. That’s when we asked ourselves a question: are our students ready to engage with real world software development even before they graduate? I was quite convinced that our students could handle it and engage with industry – after all, many of them find a job even before finishing the course. “We decided to give the process a shot, prototype it, make it happen and learn from the experience. Basically we followed the same Agile process that we use when building a piece of software, but in creating a collaboration with industry partners. All we needed to make this happen was a company with a need for a small software product and a strong group of students eager to work with them. “Within weeks, that idea materialised in a sustainability consultancy Beyond Green teaming up with three of our students to build an online dashboard tool. From then on, everything started happening very quickly. Paul Adderley, MD of Beyond Green: “I first heard about CodeClan at a Women Who Code meetup in March 2018. Inspired by CodeClan’s mission, I contacted CEO Melinda Matthews to explore how we could work together. Within an hour, Pawel and I had outlined an approach and the project was born. Paul: “The fundamental challenges for small and medium businesses (SMEs) implementing sustainability are time, expertise and money. These barriers prevent them from making informed decisions about resource efficiency and understanding their impact on sustainability. “We want to remove those barriers in an easy and cost effective way so all businesses can access resource efficiency savings and embed sustainability in their strategy. “Look at the bigger picture. In 2015 the UK, along with 192 states of the United Nations, adopted the 17 Sustainable Development Goals, following the largest public consultation ever undertaken – a global framework and roadmap towards a more sustainable world by 2030. At work in Beyond Green’s Edinburgh office. Paul: “Developing a sustainability platform with SMEs in mind is at the core of Beyond Green’s strategy and aligns with our values of fairness and ambition. With theArena17, businesses will measure their contribution to achieving the UN’s 17 Sustainable Development Goals and support Scotland’s National Performance Framework. “We needed to take theArena17 from an idea on paper to its first step that will help us with market validation. CodeClan were the flexible yet responsive partner, with software development expertise and a keen interest in sustainability. “Our next step was pitching this opportunity to CodeClan students in order to attract a small team of passionate and talented individuals, who would be keen to learn and share their knowledge while challenging us. Claire Connachan, CodeClan student: “Myself, Simon and Mike decided to work together on the Beyond Green brief, as we felt it would be a brilliant team-working opportunity and give us some valuable experience working on real projects to real deadlines. Day 2 – What’s the minimum viable product (MVP) and the user experience? 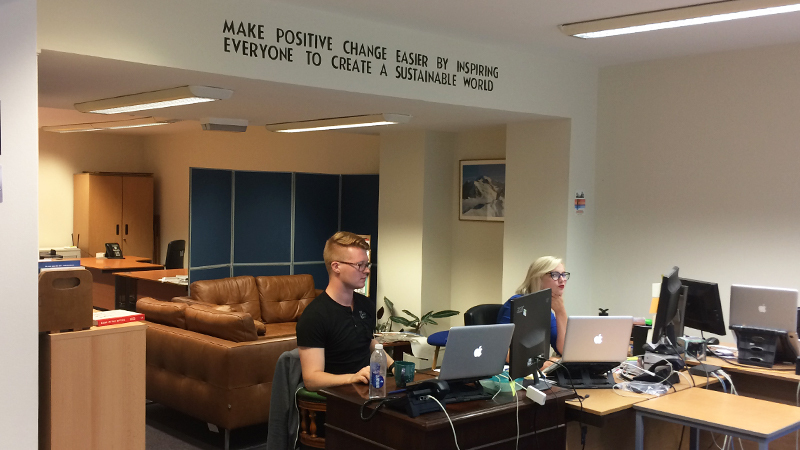 “We worked at the Beyond Green offices, spending the day planning our MVP and understanding the project’s users. “This was a really interesting process; we worked with Beyond Green colleagues to pull together a proto-persona, wireframing and priorities for the build. Chatting to the client gave us a much firmer idea of who we were building the app for, and we were able to plan everything much more accurately. “As a bunch of keen beans, we spent Sunday afternoon coding our setup and getting the ball rolling. We decided to build the application in React, as this was the newest framework we’d learned and we were all keen to get practice in. “We hit our first big bug. As we were using both a database and the React framework, we had to learn how to get the two communicating with each other. We set a timer for 30 minutes before asking for help, and managed to nail it within 29 mins. “After getting a bit bogged down with data visualisation on Monday, today was spent fine-tuning our graphs and moving on to additional user inputs including checkboxes. We enjoyed yet more bugs at this stage, as React’s downwards-data approach gave us some headaches with the architecture of the application. “Our last day of coding, we ploughed onwards with other features and functionality, as well as some CSS to give our app a little bit of sparkle. Pawel: “This was the first time we engaged in this type of collaboration, and the experience seemed to be overwhelmingly positive for all three sides. Claire: “As students, we had never worked on a ‘live’ brief before or managed a relationship with clients, so it was a brilliant opportunity for us to get a feel for the process. “We learned how to be more self-sufficient and solve bugs using our own knowledge and experience, rather than relying on class notes or instructors to come to our aid. Estimating features and functionality was also an interesting learning curve – in short, it is always going to take you much longer to do something than you originally think. “The project allowed us to experiment with a new framework, and we tried lots of new things to get our heads around its personality. Documentation, tutorials and good old problem solving came to our aid and we enjoyed exploring the nuances of React. If you’re a business looking to access a fresh perspective and up-to-date skills, get in touch with Graeme Jarvie, our Industry Engagement Manager: graeme.jarvie@codeclan.com. Come along to our next info session and we’ll talk you through our curriculum, student projects and opportunities in the tech sector.